Darlings, to your left you will find Report’s blissful Bowie Boot; to the right prepare to fall in love with R2’s Bauer Bootie. Though Bauer is constructed out of synthetic letter and proffers a suede wedge, as opposed to the true leather crafting of the Bowie; for just $49.95, in comparison to the $130.00 needed to call Bowie your own, they are a fabulous alternative for the frugalista – and allow you to take home not just the black, but the beige, as well! Thanks to Piperlime and DSW for the pictures. 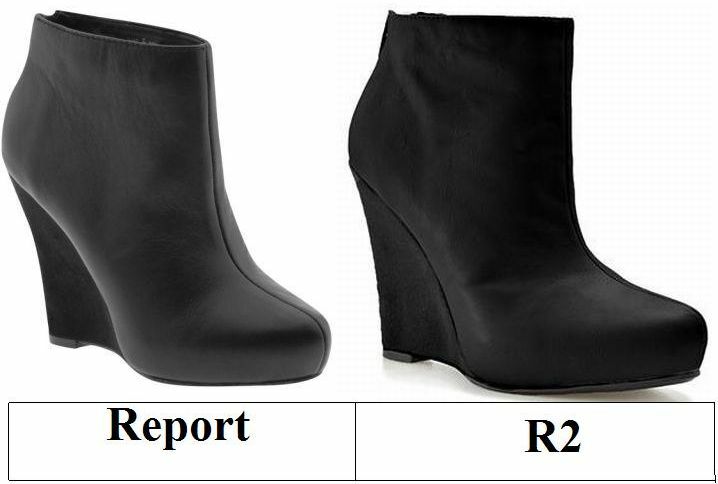 those r2 wedge booties are marvelous! i love nothing more than a stellar fashion find :) bravo, miss erika! I have to go with the more expensive option. Shoes not made of leather kill my feet! Those wedges are amazing!! splurge for sure!! I like leather so I would go w/ the more expensive ones. I don't think the price is too bad. I like the fabric of the R2. Man, I really am craving these booties now! I'd wear them with a cute dress of maybe one of the many tops I just bought at Forever. $130.00 is a really great price for the boot. $130 isn't that bad for a boot I'd probably wear all season. I'd go for the real one because it'll be better made. Love this post - who would know on the street that they were synthetic?! I actually like the R2 better! i'd have to spend! the report ones look way better! I think I'd have to go with the thrifty version! Not sure about the quality but I like the look of the cheaper ones better! I truly think when it comes to feet..best to put the shoes on before buying either of them. Especially, if you intend to wear them the distance. So it would depend on the better fit. I just bought the Sketcher's active and I wore them in the store for quite a bit before I decided on them. But even then. I found someone had put a 7 1/2 in the 7 box. Beware of all sorts of things when shoe shopping. I so love wedges. But I'm on the cheap. Always. Thanks for stopping by, now following your lovely blog! what wonderful wedges ! thank you for the info - much appreciated as ever !!! I'd have to try them on--I've learned not to cheap out on shoes! Oh those booties are gorgeous! I kind of like the no line up the front on the boot. I just doubt I'd wear anything with that much of a heel though. But a great thing to have for the fall. They are inspiring. Did I mention i don't like synthetic lether? ;)) Rubber would be better for me.So,I choose the left side. Another great find! They look so similar. Hmm. I think I'll go with the Report pair. They aren't too expensive, plus I think it would be best to go with the leather. Either way, they're both great booties! Such cool to have this fall. A cheap version for me. Very similar-- I'd love to snag a pair of those R2's! I'd get the Report, but I'm on wallet restriction so I can't even do the R2. Bless your heart Miss Erika - b/c you will be saving me money when I can get back off the wagon. The R2's, only because they're both so similar! I am rolling with the Report! I cant do cheap shoes. Makes me wish real fall days were here. I normally don't go for leather. Cool thrifty pair. Very cool shoes. I need black boots like this for winer. I love the R2 ones. oh my gosh what a great find! the R2 is perfect!! Great steal! The boots are so cute. I'm leaning toward suede booties for fall, but these are SO cute! I love the wedge. The R2 Wedges are gorgeous and I love them much more than the Report wedges. What I don't enjoy is that split down the middle. So, I will definitely go thrifty. tough choice because I like to pay for shoes that will last and sometimes they are the pricey ones and sometimes they're not... what to do? Wedge boots are the best! Thanks for the great find. Oh my gosh! WANT! I want the R2 ones!! I saw a pair similar to these at Forever 21. I love clunky booties like these! I'm just not understanding these boots. I know they've been quite popular lately, but I am just not seeing it. They are coming out in Forever 21's new line this fall, so maybe that would be another inexpensive place to try. Can't say I am a fan though. Hmm, I really do like Report boots, and $130's not terrible. I guess that I'll be the big spender today. Hello my love, how are you! I love them both, so thrifty for me! I hope you are having a wonderful September Erika! I prefer real leather so I'd pick the pricier one this time! i actually like the R2 boot better. Totally like the R2 pair more! I O-M-G love these boots!!! Drro-ooo-ool! I just love the color of the Charlotte Russe version. That "dark" blue shade has been included in so many fall collections this year. Christian Siriano showed a similar one shouldered, deep blue, satin dress in his 2010 fall collection as well. The shoulder detailing was a bit larger, but the two pieces are extremely alike. Price wise though, this one definitely wins my vote; the pocket detailing is the first thing that caught my attention and I just love it. Give me a cute blue dress with pockets any day and I'm SOLD!